To try to find the recipe of a good bait is incomparable pleasure. But it is necessary to return to a question: on what the salmon fly, is similar more correctly what should be an effective fly? Such question is more correct, considering that speech will go now about catching. Present disappointment degree when the found salmon fly appears - to catch only empty tribute of tradition a salmon on the salmon. Essentially I was ready to recognise that the salmon comes across on imitation sedges, stonflies, and on other small, including fantasy flies. When you stand on a belt in ice water and you work in the true sense of the word, trying to throw further, to spend more deeply, it would be desirable to think that it is simple and annoying accident - a salmon on a trifling fly. It is possible to tell that there was already such reception at catching of a salmon - to go to catch grayling. It is an old story, but to draw any conclusions I try now. 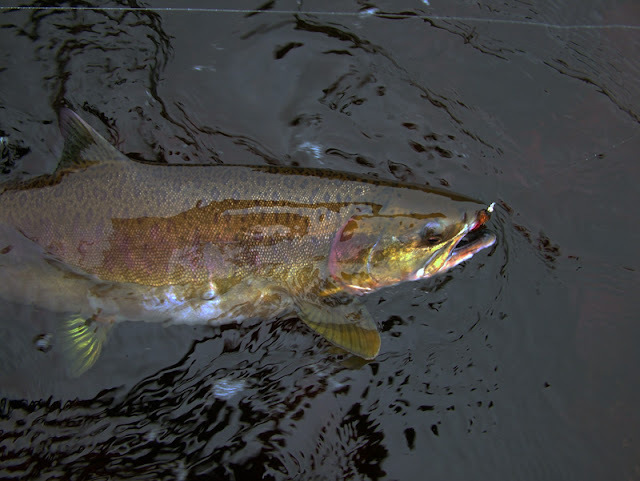 Any fish, and salmon not an exception in the behaviour, is guided by three basic instincts. Allow to name their instincts of self-preservation, reproduction and eating which role can change depending on conditions. This combination defines not only research and aggressive behaviour of fish, but also a reflex on food presence in river water which nobody cancelled! The eating instinct does not vanish, though, certainly, is muffled against high concentration of sexual hormones. Can be more correct at once to tell that I want to break off the settled chain of dogmas for the beginners, one of which links is the rule from the same scheme - «the big water - the big bright fly», or, for example, «small activity of fish - a small dark fly». Other approach is necessary at least because not clearly in what "activity" of fish, a leah in aggression or reaction to food occurrence is shown. Supervision over attacking fish not only thing emotional, but also informative. One fish has induced me on the whole series of experiences. It stood on depth from 1,2 to 1,8 m. at an input in a wide small rift. I offered it working till now salmon flies, but the salmon did not react, inertly rocking in a shade of stones. It has quickened at the sight of olive soft hackle sedge on 14 hook from grayling box and instantly became "active". Similar metamorphoses regularly repeated and further. Essentially can exchange nothing in behaviour of fishes. Attacks to the live objects which are of value from the fish point of view, are carried out not somehow especially but only how it is observable at others salmoidae in the river. 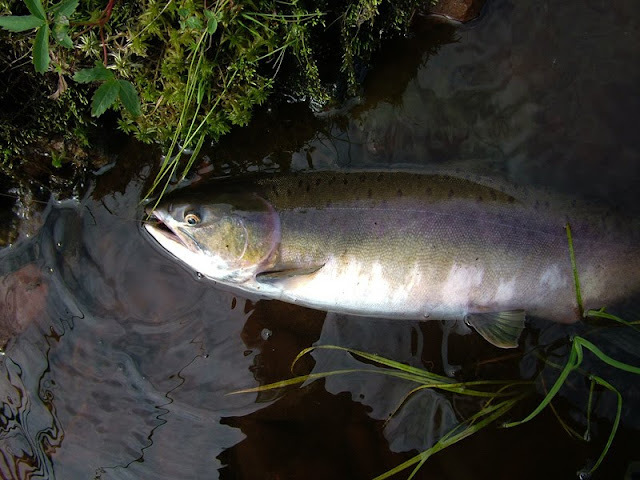 Character of movement depends on a place which is occupied with a salmon more often and... Character of a fly. The fly under a surface calls lifting of fish with education of a classical hillock and a breaker at leaving downwards. Sometimes all occurs absolutely easy, the salmon rises almost vertically to a surface and quietly takes a fly. Thus anything on a surface does not occur and only the intuition forces to make cutting. The majority of fishes in such cases is marked for the tip of a nose, how both our usual grayling and the trout slowly collecting, collecting, a forage at a surface. At fly leaving aside from a parking lot of a salmon, fish rises and also on a diagonal follows a fly, studying it, leaving a wavy trace on water. The similar picture happens at attempts of fish to attack dry sedge, leaving with a furrow aside. In fast water of rifts or streams in stones, it is periodically possible to observe traces of a spontaneous exit of fishes to a surface. To regard all it as simple movement or fuss near to a spawning hole easier. But submit an ordinary wet fly and we will receive similar movement of fish which now we can name only attack to eating object. Supervision of the fish evolutions at a surface are accessible to everyone and hardly will call many objections. The first lifting of a salmon to a surface for a fly has been described in 1659 when as salmon flies in modern representation also did not smell. It not summer entertainments as fish and in the spring in cold water and later, behaves in the autumn. The same hunting for flies goes and in depth at a bottom. Hungry diet or over effective digestion? Pikes in a salmon rivers. Salmon fishing.